Bento is a Japanese style of eating where lunch items are packed into a wooden or plastic box with individual compartments. 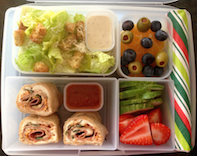 Bento lunches consist of a balance of food groups, colors and textures. We’ve expanded on this concept by creating themed HHC Bento Lunch classes that combine MyPlate Nutrition standards, colorful fresh foods, and a special lunch box system that parents may purchase. We’re empowering kids with healthy options and limitless choices. In these classes, kids will learn how to create a colorful, fun, and nutritious Bento school lunch that can be replicated at home based on MyPlate nutrition standards. We offer 12 different lunch themed classes to keep your child excited about packing lunch for school. We suggest you register for several themed lunch classes to give your child the best variety and experience in the kitchen. Your Certified Instructor provides the selection of classes that they will offer. Many of our healthy lunch classes can be created as a vegetarian options using substitutions. Contact your instructor for details. Each HHC Healthy Lunch Class is two hours in length. We start with a 30 minute nutrition game or activity to teach your kids about making important choices. Then we chop, blend, slice and whip our way into making a colorful themed lunch followed by clean up and a sit down meal. Your kids will be empowered to replicate their lunch at home and definitely won't leave hungry!